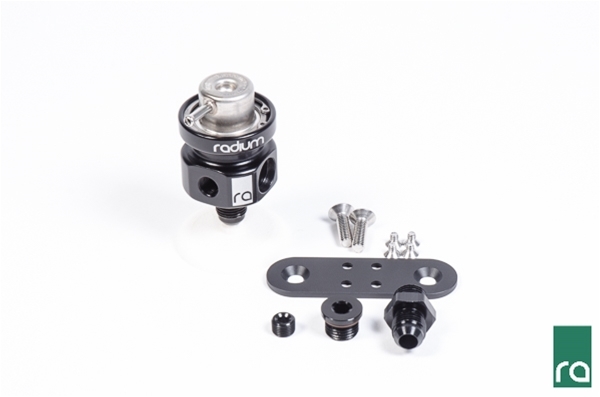 This universal Radium Fuel Pressure Regulator (FPR) is built around the common OEM Bosch regulator tops found in many Audi/VW (and other) applications. The compact billet aluminum housing provides a convenient package for plumbing and mounting. The regulator body is held in the housing with a stainless steel snap ring and can easily be removed for cleaning or replacement using snap-ring pliers. The Bosch regulator tops are vacuum referenced with a 1:1 ratio. The two main high pressure ports are threaded for 6AN ORB. There is also a 1/8 NPT female port for a gauge, pressure transducer, etc. Each regulator body is laser etched and anodized for a superior finish. Radium offers two different GENUINE Bosch regulator tops: 3.0 Bar (43.5 psi) static and 4.0 Bar (58.2 psi) static. NOTE: The exact min, static, and max pressures are influenced by the flow rate of the fuel pump being used. These FPRs are tested using a common Walbro 255lph pump. If a higher flowing pump is used, the minimum pressure ratings may be higher than advertised. For applications with more pump flow, consider a high flow fuel pressure regulator. NOTE: The 3 and 4 Bar Bosch regulator tops are NOT adjustable. If a regulator top is not needed (already have one from another source), select Radium 20-0014. This option includes everything needed with the exception of the regulator top, as shown below. These come assembled with the Bosch regulator unit installed in the housing, as shown below. Radium also offers an optional fuel pressure gauge (shown below). This secures to the front 1/8"-27 NPT port of the fuel pressure regulator housing.